STEWS ARE MADE FOR WINTER. Comforting, soothing and easy to prepare, they're perfect on a snowy night in front of a fire, or binge-watching your fave TV show. This is a delicious one, A COMBINATION OF TWO FISH CURRY RECIPES THAT I LOVE. One has been in my recipe rolodex for years, the other, my friend "Lainey's find" from Food 52. 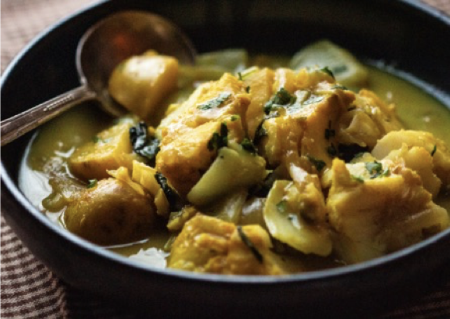 Except for sprinkling the fish with some ground turmeric and salt for a few minutes, which adds another layer of flavor to the stew, this is basically a one pot wonder. Lots of onions, garlic, fresh ginger, curry and a little heat from some jalepeno, all simmer in wine and coconut milk resulting IN A DEEP FLAVORED BROTH for the bok choy and fish. And, stirring in some Major Grey's chutney and fresh lime juice at the end makes this dish sparkle. So, sit back, relax while the snow falls and the temperature dives, and ENJOY! 1. It's best to buy your fish the same day that you plan to make the stew. 2. Full fat coconut milk is best, but you can substitute light coconut milk. Also this does not mean coco lopez which is sweetened. 3. You'll see a few ingredient amount choices. My preferences are listed first, but you can adjust to your taste. 4. The fish cooking time may vary, depending on how big you have cut the pieces of fish. But basically the fish will be done when it just begins to flake apart with a fork. Around 4-5 minutes. 5. If 4-6 servings is too much, you can easily cut the recipe in half. 1 13.5 oz. can of coconut milk, full fat is best, but lite is ok. In a medium bowl, add the fish and sprinkle with the turmeric and salt. Toss to coat and let sit for 5-10 minutes, while you're prepping the vegetables. Add the bok choy and chutney, stir to combine, and cook for another 2-3 minutes. Add the fish, pressing the pieces into the liquid so that they are submerged as best you can. Cover the pot and simmer for 4-5 minutes, until the fish is cooked through and flakes easily with a fork. Stir in the lime juice. Ladle the stew into bowls and serve with an extra squeeze of lime if desired. Can be stored in the fridge for 2 days.